a few weeks ago i mentioned that my brother, jonny and i had been out foraging mushrooms from the wild... so today, i thought i'd share some photos, and a little info about what occurred that fateful afternoon. firstly, it's probably very important to say that you have to be extremely careful when mushroom foraging - some are very poisonous and even deadly. BUT, there are really good guide books and a great wealth of online resources to help guide you to know whether what you've found is actually edible, so it's worth giving it a go, because they can be super nutritious, very tasty, and are of course, FREE. jonny and i have been meaning to go mushroom hunting for a long time now, and one sunny wednesday afternoon we just decided to go for it. bag in pocket, dog on lead, wellington boots on, off into the local fields and forests to search for fungi. and we found some nestled in some nettles, in a field full of sheep. we found two other varieties, but decided that they were too small, and too questionable to bother picking (one lot was growing on a rotting tree stump, the others were randomly growing by the footpath where dogs run, hmm). the ones that we found were massive, so even though we didn't know what variety they were, we figured they were in a good location, and because they weren't red with spots on, that we'd be at least 50% of the way to knowing they were probably edible. this foraging guide to mushrooming. we decided that our mushrooms were shaggy parasols (macrolepiota rhacodes) and that therefore they'd be fine once cooked! 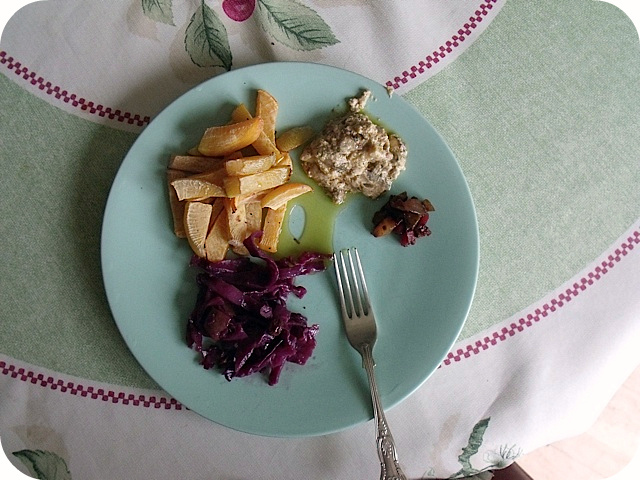 we were absolutely terrified that we might poison ourselves, and so jonny decided that the only way to try them was to cook them very thoroughly, to be on the safe side and avoid 'gastric upset' which can sometimes occur with shaggy parasols. ♥ firstly, jonny fried them in butter and mixed in some herbs and cream cheese to make a mushroom sauce type thing, which we had with swede fries, swedish red cabbage and chilli chutney. the flavour of the shrooms was very intense, and delicious! 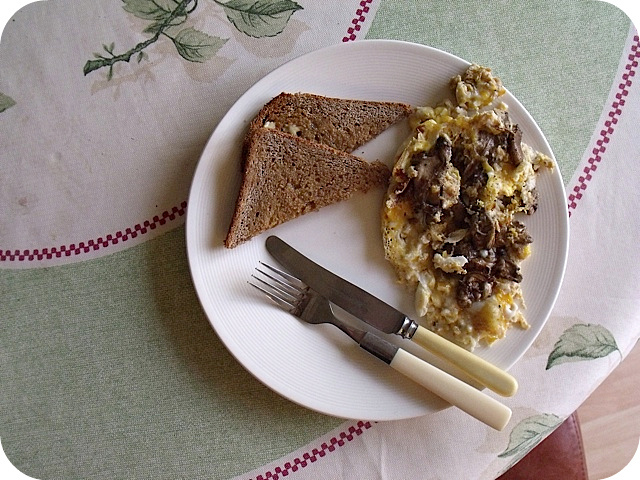 ♥ then the following day, we made a mushroom omelette. which was divine! rich flavours, simple, wild ingredients. and i'm sure lots of extra goodness from their having been grown in the outdoors near some sheep. so next time you fancy a little free wild mushrooming: be appropriately cautious, be thorough in your research for identifying them (make sure to check regional websites for tips on what grows locally and where - UK mushrooming guides will vary from the US and France, for example) and then go for it! but probably don't eat them raw. have you ever been mushrooming? what's your favorite way to eat mushrooms? celeryandcupcakes: I have never been mushrooming before. I've always found foraging interesting and would love to do it, but I've always feared that I would pick up something poisonous. keephealthstyle: I'm a bit funny with mushrooms - my husband loves them and eats them raw but when I have them I need them to be well cooked and almost hidden in dishes with other flavours. I'd love to go foraging for him though! tamzin: I never have but it looks like fun and I love me a good mushroom! Favorite way to eat them would be with eggs and rye toast or roasted of course! ursula: I go to mushrooming every single year just to pick one type of mushroom that I love: Macrolepiota procera. Put them in a pan with a little bit of olive oil and some garlic. Yummi!